The compression pliers are designed for hydraulic crimping on power cable and wire. 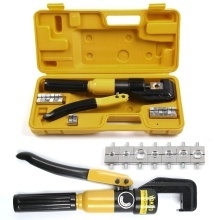 C shape crimping tool head, with safety equipment, convenient for manual hand operated. High efficiency and labor saving, high speed hydraulic pressure working. Guaranteed quality with easy operation. With safety valve inside, protecting crimping machine. The compression pliers are designed for hydraulic crimping on power cable and wire. The crimped conductor is tested in high conductivity and close contact so that it&apos;s uneasy to break out and turn hot. Well-designed structure, open cut design for convenient operation. Dies are quickly put on tube by double speed unit. Then compression force lift and automatically change to low speed.